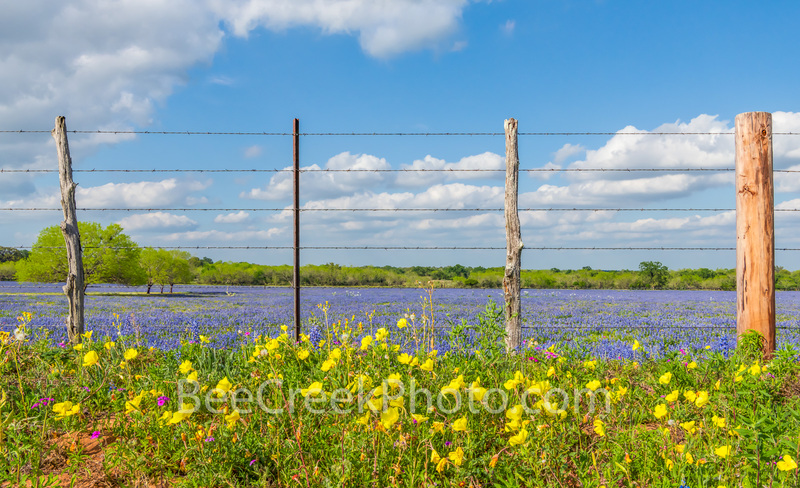 Wildflowers Along the Barbwire - South of San Antonio we capture this nice field of bluebonnets with buttercup growing along the barbwire fence post. We like the contrast of the all the elements in this iconic Texas scene. This was the best field of bluebonnets we came across and with the nice yellow buttercups and green mesquite it create this wonderful texas wildflower scenery. This year crop of wildflowers south of San Antonio seem to be the best it been in a while but it is going down fast and the poppies have overtaken many fields so the other wildflowers can't be seen. In any case this is your iconic texas wildflower scenery which comes with blueblonnets, buttercups, mesquite and barbwire. Photo © copyright by Bee Creek Photography - Tod Grubbs / Cynthia Hestand.